Be it an ecommerce portal or a blog for your business, a robust user interface makes your users visit again and again. A number of times I visit ecommerce portals not to make a purchase but only to choose a product. The simple reason, they have a list of products which can be filtered based on various criteria (e.g. price, brand, version etc). For example, have a look on the filtering option of Amazon.com. WordPress is first love to make websites nowadays. Easy to use backend and availability of a wide range of plugins and themes have made it an obvious choice for professional portals as well. Adding these kind of navigation options certainly add a good value to your website. If your requirement is limited to adding a filtered navigation on the basis of WordPress Categories and Tags only, this job is as easy as installing a plugin. 1. Install and activate Cat + Tag Filter plugin from WordPress backend. 2. Visit Appearance > Widget and locate the widget called Cat + Tag Filter. Drag this widget to your sidebar. 3. Setup the widget by choosing appropriate options. 4. That’s it. Visit your blog and you will find a navigation widget with categories and tags as filter options. The limitation of this plugin is that the navigation is based on categories and tags only, hence sounds incomplete for an exhaustive user interface. If you need a widget with better and more navigation options (like the Amazon widget), there’s a trick for that too. You heard it right. We need to use the custom taxonomies functionality of WordPress to achieve this goal. Initially there were only two taxonomies in WordPress i.e. 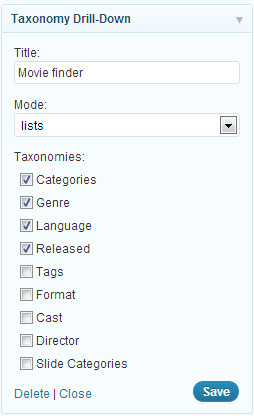 Categories and Tags, but now WordPress allows users to add custom taxonomies as well. 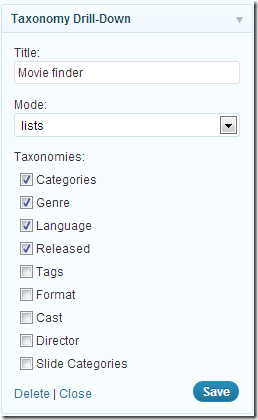 For this example, we will make a Movie finder widget with custom taxonomies like Movie Genre, Language, Release year etc. We will achieve this with the help of 2 plugins, GD Custom Posts And Taxonomies Tools by Milan Petrovik and Query Multiple Taxonomies by Scribu. 1. Install and activate both the above mentioned plugins from your WordPress backend. 2. Visit GD CPT Tools > Taxonomies and click on add new. 3. Fill in name, label and click the Auto fill rest button. The plugin will automatically populate rest of data. click Save taxonomy button. 4. Repeat this step to create all the required taxonomies. 5. Now assign these taxonomies to posts (or custom posts). This is done the same way you assign Categories and tags. 6. 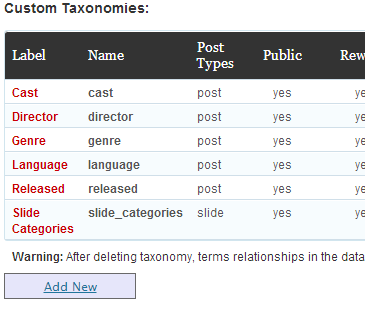 Visit Appearance > Widgets and locate the widget called “Taxonomy Drill Down”. 7. Drag it to the sidebar and configure it as needed. 8. That’s it. Visit your WordPress site and start using that cool navigation widget to filter the posts. Feel free to ask if you are stucked somewhere. Any help would be greatly appreciated, thanks in advance!! If none of your post/product tagged with small are also tagged with medium, the medium will automatically be disappeared. so the simple solution is to tag a product wit everything.